This play was performed at the Kado Theater in Osaka in 9/1841. Unfortunately, nothing is known of this play. "The animated composition relies in part on the strong diagonal established by the cresting waves, à la Hokusai, in opposition to the slanting metallic rain." Barely a dozen designs are known by Toyohide, and impressions in good condition are rare. 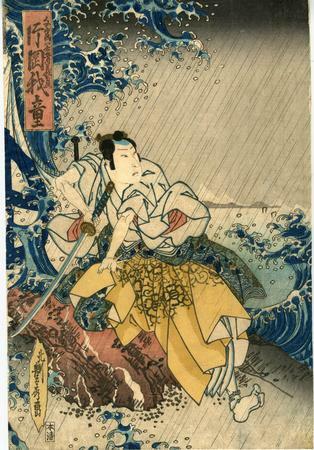 Formerly in the Okada Collection (featured in Kuroda Genji's 1929 "Kamigata-e Ichiran" Review of Kamigata Pictures). Illustrated in Ikeda bunko, Kamigata yakusha-e shūsei, vol. 3, 2001, #216.